Welcome to the 2nd installment of Soup Week! I'm sharing a different bowl of soup with you every day this week. Enjoy! Have you ever heard of garlic soup? I hadn't, until very recently. It was quite the revelation. 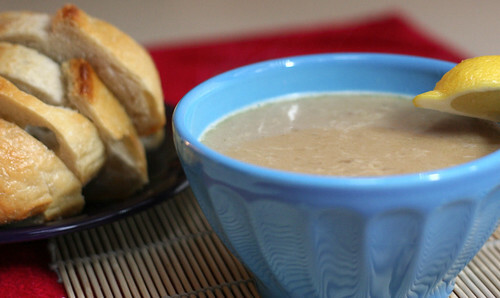 There is a wealth of recipes out there for garlic soup, and I chose one from Bon Appetit magazine. The lemon, of course, is what sold me, and this bowl of deliciousness easily lived up to my high expectations. I'm getting better at riffing on recipes, using a well-tested, established recipe as a base to make my own modifications, and that's what I did here. It makes cooking just ever so slightly more fun. Don't forget the lemon, okay? It adds an extra dimension to the soup that makes all the difference... trust me! Please see this post for some tips about safely pureeing extra-hot things in blenders. 1. Preheat oven to 350°F. Place 34 garlic cloves in small glass baking dish. Add 2 tablespoons olive oil and sprinkle with salt and pepper; toss to coat. Cover baking dish tightly with foil and bake until garlic is golden brown and tender, about 45 minutes. Cool. Squeeze garlic between fingertips to release cloves. Transfer cloves to small bowl. 3. Divide grated cheese among 4 bowls and ladle soup over. Squeeze juice of 1 lemon wedge into each bowl and serve. Ooh. This sounds just about perfect. Wow, that a lot of garlic! I'm sure the soup is fantastic =D. Mmm, I bet the flavors are fantastic. Really looking forward to making this once and for all! I am loving all kinds of soup right now. It is so warming and comforting. Love this one! This soup sounds awesome. I love the flavor combos!! Can't wait to see what's for tomorrow! Does that say 3-4 cloves of garlic or does it say 34. Whoa. I know my husband and I will love this. I love the combination of these flavors.